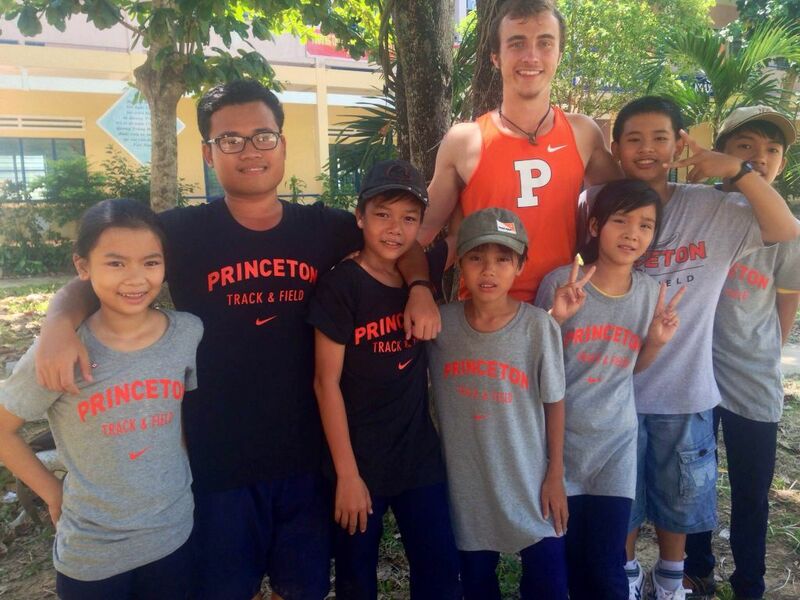 Our second conversation is with Bryant Switzer ’17 (track & field). When I first found out I was selected to represent Princeton in Vietnam, I really had no clue what to expect: culture shock, possible communication problems, and I wasn’t too sure how the Vietnamese would treat an American after the war; would they be friendly or still holding on to a grudge from before I was born? Never having been out of North America before this summer, I had no idea what to expect in Vietnam, besides the fact that I expected something radically different. While I didn’t feel shocked from the living differences, the language barrier, or even the use of a bidet, what really surprised me was my undying fascination with the country. The first week everything was still new to me, the rural countryside, markets, shrines, statues, beaches and the luxurious downtown of Da Nang City. Yet even after experiencing all of this, I was still in awe everyday, everywhere I went, even when I went back to the same places I had already been. It’s like I was star struck, but instead of being unable to ask for a picture and an autograph I found myself unable to leave. I don’t think three months instead of three weeks would have made it any different; Vietnam just has an aura that drew me in, and I’m already hoping to make a return trip. My assigned teaching and coaching duties were mathematics and baseball, respectively. In the classroom, the most difficult problem I ran into was writing the numbers 1, 2, 4, and 9 on the board, as the Vietnamese make the numbers in a slightly different manner, the most significant difference being that a 9 often ends up looking like a lowercase “g”. The kids laughed at my incompetence with “correctly” writing the numbers, and that silly little difference actually helped me hold their attention, cause as we all know, kids like to laugh and make fun of those older than them. So if making fun of my numbers got the kids to pay attention while waiting to pounce on my next goof up, so be it! The strategies that worked best for me was using my hands and demonstrating things a lot more, and since I had the luxury of a Vietnamese translator, I learned it was better to speak in short, precise sentences and to only speak one or two at a time and wait for the translation before moving onto my next sentence. Smiling and making faces at the kids also helped a lot, and there was certainly never a shortness of smiles. Can you tell us a little about the children you taught as part of the program?What is your favorite memory from the trip? Picking a single favorite memory from the trip is near impossible, but I definitely enjoyed my time spent with my kids the most. There were three kids in particular that greatly impacted me personally, one being a girl in my morning class, another a boy in my afternoon class, and the last a young boy named Hieu who was a child too young for camp but came everyday regardless. You could say Hieu became my “assistant coach,” as he participated in every baseball lesson in both the morning and afternoon sessions. He was the funniest kid I’ve ever met, and at the same time one of the most helpful and kind. The thing I will always remember about him is that he wasn’t afraid to laugh at himself, and just shook it off or laughed along if others laughed at him. Because of this, I learned a valuable lesson in being more shameless, and not letting the little things ruin your day. The girl, who I called “my girl” in Vietnamese, gave me a serious lesson in being passionate and taking pride in what you do, and I wouldn’t be surprised if she became a major leader for females in Vietnam someday. Her strength and ability to stick up to the boys in the camp set her apart and I saw her as a symbol of being strong in the face of adversity. The last, and most influential child from the camps was the boy in my afternoon class who I nicknamed “Messi.” After I told him I was recently in Argentina, he told me that the Argentine national team was his favorite, and once I called him Messi after seeing how good the little guy was at soccer his smile affirmed that was a good nickname for him. Messi taught me the most, and realistically taught me more than I taught him even though I was supposed to be the one doing the teaching (part of this is probably cause the little guy was too smart for his age so everything I taught in class was review for him because he’d learned it on his own). I saw a lot of myself in him, and I think he is a very similar person to how I was at that age. He tried hard in school, but was naturally smart, he worked hard and listened well during the sports, but he was naturally a good athlete, and he was also a jokester and the little comedian had the power to send the entire class into a fit of laughter whenever he pleased. All of this, he was able to manage while growing up dirt poor with next to nothing besides a cheap ball made of hard plastic that he uses to play soccer with. Yet, the kid was happy 24/7. He smiled almost as often as he blinked his eyes. He showed me that if he could be all he is with as little as he had, that I could do whatever I wanted with my life, and reaffirmed the saying that anything is possible. Saying goodbye to him for the last time was one of the hardest things I’ve ever done, and I hope I get the chance to see him again someday. How have you changed as a result of participating in Coach for College? What is the most important thing that you learned/realized from this opportunity? The most important thing I learned from the trip is that money does not determine happiness, but that happiness is all dependent on ones mindset. After seeing the Vietnamese children laughing and smiling all the time, and having a blast with a soccer ball that cost a mere 25¢, it taught me to value those around me more and to enjoy the moment I’m in rather than worry about money and making money. Not having access to wifi/my cell phone all summer long also helped define the importance of living in the moment. I learned how embarrassing it is to be greedy, after seeing another American coach stuffing her book bag full of snacks provided at the camp while the Vietnamese children wouldn’t accept more than one snack no matter how many I offered or how hungry they were. I hope all of these lessons stick with me for life, but I’m positive I will never associate happiness with material gains ever again.